London Design Festival 09: products from New York shop Kiosk are on show this week in a pop-up space designed by British designer Michael Marriott for London design brand SCP. The exhibition will show objects selected from Kiosk, a design store in Soho, New York, which stocks everyday products from around the world. These objects are sourced by Kiosk's owners, Alisa Grifo and Marco Romeny, during bi-annual worldwide trips. The store aims to celebrate the beauty of the found objects, by presenting them in an exhibition format. This is the first time that Kiosk objects will be for sale outside the USA. The exhibition uses plastic storage crates and sheets of plywood to display the objects. The pop-up shop will be open to visitors until the 27th September. KIOSK, a carefully chosen selection of humble and straightforward objects, will be hosted during London Design Festival by SCP in a temporary shop designed by Michael Marriott. During a trip to America this year, SCP were pleased to make the acquaintance of the American design store KIOSK in Soho, New York. KIOSK has established it’s very own style of design retail by presenting objects in an exhibition format. 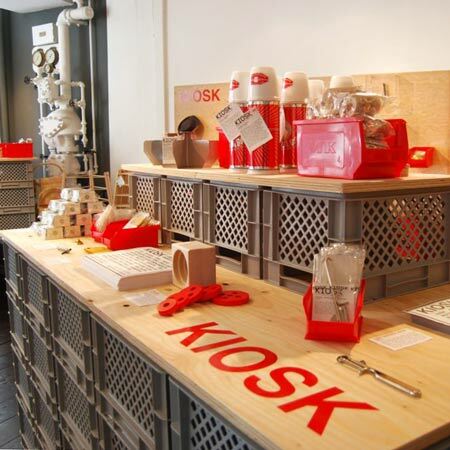 KIOSK is run by Alisa Grifo and Marco Romeny who opened the store to offer an alternative to over-design. They take bi-annual trips to different locations across the globe to source carefully considered objects of simplicity and beauty. The goods assembled together become a rough portrait of each trip and tell about a place and it’s people. Often they are traditional goods that have developed over generations or anonymous design found in general stores, DIYs and kiosks. Products created by not one personality but things that are the result of local aesthetics and needs. Their beauty is sometimes hard to see in today’s market; the motivation behind KIOSK was to shed some light on these anonymous objects and support independent producers. This September, SCP is the first shop outside of the US to exhibit and sell a selection from KIOSK's collection of goods.